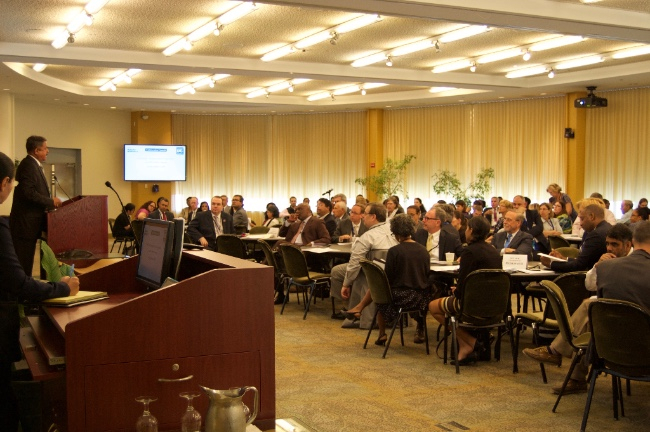 New York City Health + Hospitals President/CEO, Dr. Ram Raju, addresses the over 200 attendees at the Doctors Council SEIU and NYC Health + Hospitals Joint System-Wide and Facility-Based Collaboration Councils meeting of front-line doctors and administrators. Click on the button below to download a Power Point slide deck containing information on the projects underway at all H+H facilities and hospitals. Slides are available for download as an Adobe PDF file. Click on the drop-down menus below to see the Facility-Based Collaboration Council members. System-Wide Collaboration Council members are denoted in bold.